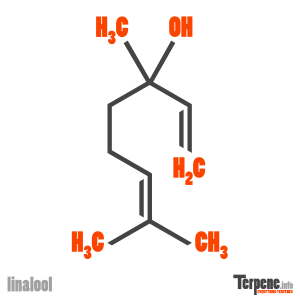 Linalool is a terpene alcohol with a citrusy, floral, sweet, bois de rose, woody, green, blueberry scent. Linalool is able to act on the opioidergic and cholinergic systems to relieve pain, a unique pathway for terpenes. Linalool also acts as an anticonvulsant, having similar effects to diazepam. Linalool has been used as a relaxant and as a treatment for anxiety for thousands of years. In scientific studies, linalool was proven to sedate mice and also mitigate anxiety. Combustible liquid. Store in a well-ventilated place. Keep cool. Keep away from heat / sparks / open flames / hot surfaces. No smoking. In case of fire: Use appropriate media to extinguish. May be harmful if swallowed. Harmful in contact with skin. Causes skin and serious eye irritation. Wash thoroughly after handling. Avoid release to the environment. Wear protective gloves / protective clothing / eye protection / face protection. IF ON SKIN: Wash with plenty of water. IF IN EYES: Rinse cautiously with water for several minutes. Remove contact lenses, if present and easy to do. Continue rinsing. Call a POISON CENTER / doctor if you feel unwell. If skin irritation occurs: Get medical advice / attention. If eye irritation persists:Get medical advice / attention. Take off contaminated clothing and wash it before reuse. Harmful to aquatic life. Dispose of contents / container in accordance with local / regional / national / international regulations. Read through our forum on Linalool below, or start your own topic. This forum contains 26 topics and 3 replies, and was last updated by Lillysom 5 days, 10 hours ago.